Escape to Cocos Island on a liveaboard scuba diving trip in Costa Rica! Cocos is a lush, green uninhabited island resting 342 miles off Costa Rica’s Pacific coast. Rocky pinnacles surrounding Cocos are beacons for big animals and big action. Schooling hammerheads, countless white-tip sharks, mantas, tuna and even whale sharks call Cocos home. Cocos Island National Park was designated a World Heritage site by UNESCO in 1997. Weather permitting, OKEANOS AGGRESSOR I® guests are shuttled ashore to hike through the jungles of Cocos and swim in her many waterfalls. All ten-day trips offer seven days of Costa Rica liveaboard scuba diving. 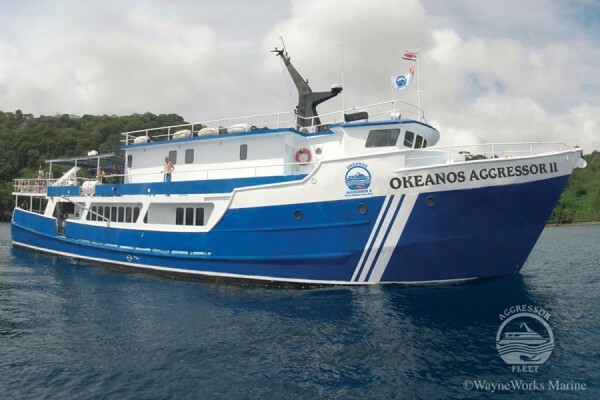 The OKEANOS AGGRESSOR I® sets off from the port town of Puntarenas. USD , $350 Park Fee (8 night charters), non-divers $250 (8 night charters), $30 Emergency Evacuation Plan,Caño Island Park/Diving Fee (7 night charters): $115 or non-diver $90 (all three paid onboard), $29 airport departure tax paid at airport (many airlines include this in ticket). All onboard sales/services have a 13% tax excluding park fees/evacuation program. All fees and taxes must be paid in cash.